Each packet of Water Kefir Grains makes 1 Quart in the first batch. To make a larger first batch, or to share with friends, select the number of packets you would like and save! If you need a high quality glass vessel for brewing, we've got you covered. The included thermometer strip(s) offer convenience and accuracy and will stay attached once applied, even through the dishwasher. The strips let you know if the brew is in the right temperature range for brewing success, or if a heating solution may be needed. 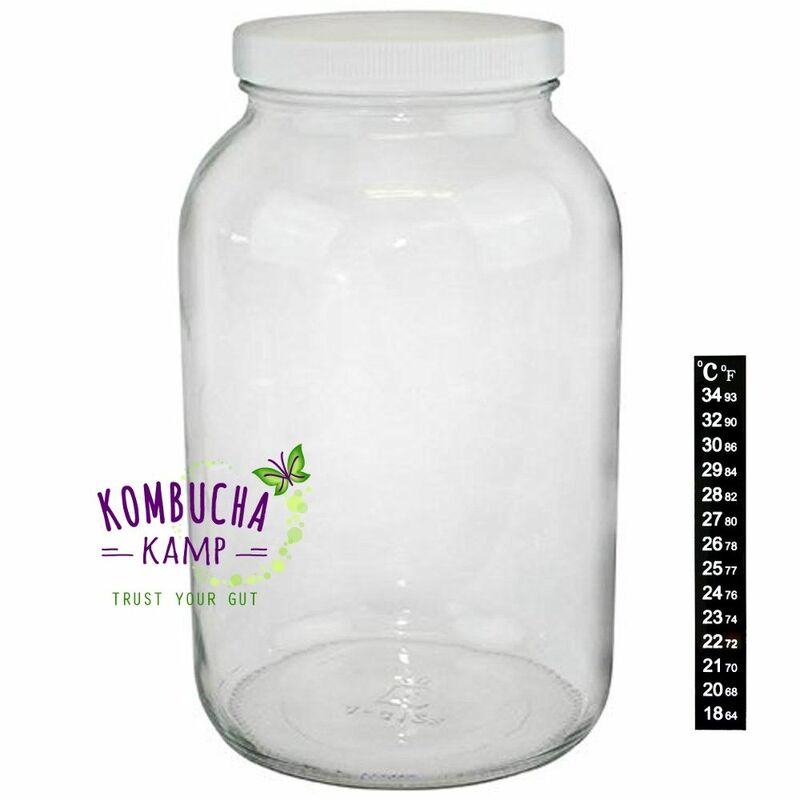 Kombucha Kamp Live Water Kefir Grains are available for Worldwide Shipping! Water Kefir Grains (also known as tibicos, ginger bug and African bees) are a composite of bacteria and yeasts that ferment sugar in a water solution to create a naturally carbonated, probiotic beverage. Water & milk kefir grains are lacto-ferments which have a milder flavor than Kombucha. Diversity is key to having a healthy microbiome (gut). Incorporating living bacteria and yeast from a variety of sources benefits the microbiome and boosts immunity. These water kefir grains can be adapted to work with Coconut water to make Coconut Water Kefir (recipe here). FREE LACTO FERMENTED SODAS GUIDE WITH PURCHASE - includes recipes for kefir cheese, flavored water kefir, beet kvass and more! These are living cultures cultivated in organic evaporated cane juice crystals and filtered water and shipped via First Class Mail. Free Lacto Fermented Sodas Guide with bonus recipes! Add more grains for deep discounts! - Why more grains? Each packet of water kefir grains makes 4 cups (1 quart) in the first batch, and can be re-used. But if you want to make a larger batches, or make a few 4-Cup Batches right away, or if you want extra packets for friends or family members...there are so many reasons to want extra Water Kefir Grains!! Add a USA Made ½ Gallon Glass Jar...or Two! FREE Thermometer Strip(s) ($4.95 value each!) make this a great value, all with FREE SHIPPING! (in the USA) - If you need a high quality glass vessel for brewing, we've got you covered. The included thermometer strip(s) offer convenience and accuracy and will stay attached once applied, even through the dishwasher. The strips let you know if the brew is in the right temperature range for brewing success, or if a heating solution (click for more info) may be needed. 68-78°F (20-26°C) is the ideal range. Kombucha Kamp isn’t just your friendly go-to source for all things Kombucha--we embrace probiotic beverages in all their wonderful forms. And of course, Kombucha is only one option for healthful fermented nutrition. Why limit yourself when there are so many great ferments to try? Water kefir is a great alternative to Kombucha. Water kefir is a naturally carbonated probiotic beverage, just like Kombucha, but it has a milder flavor than Kombucha and is made with water kefir grains instead of a Kombucha mother. Water kefir grains are not actually grains, but they are referred to this way because of their appearance. Water kefir grains are a composite of bacteria and yeasts that exist symbiotically, so they can also be referred to as a SCOBY. 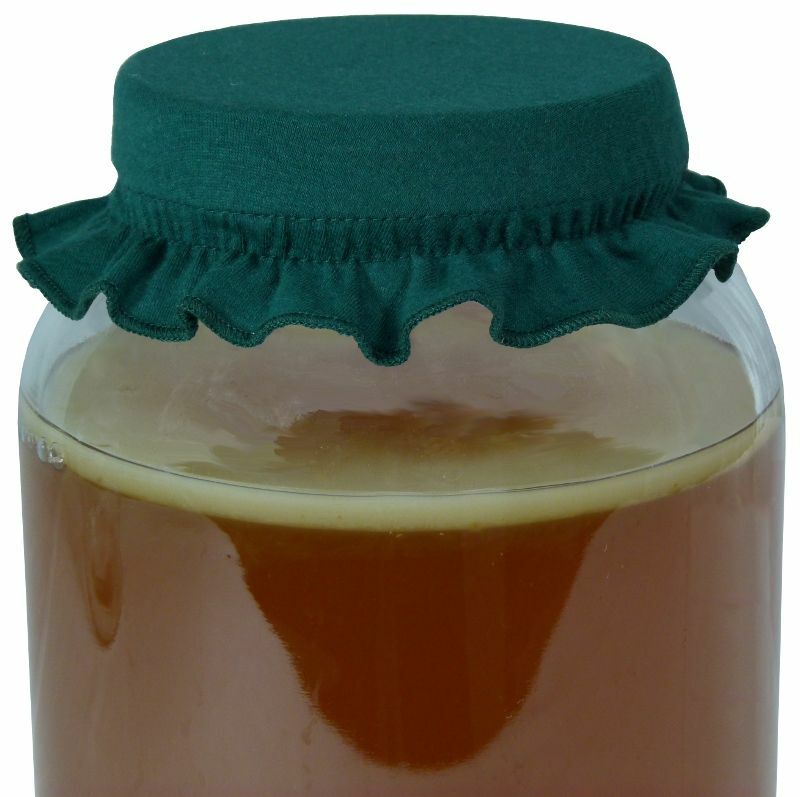 Don’t confuse them with a Kombucha SCOBY, though--they are very different. Unlike Kombucha, water kefir doesn’t require tea. The only ingredients for water kefir are the water kefir grains and the sugar water solution. Easier and faster - Water kefir requires only the water kefir grains, sugar water solution, and 1-2 days of ferment time. Kombucha also requires tea and 1-2 weeks of ferment time. Better to make smaller batches - With Kombucha, the smallest recipe starts at 1 gallon. Because water kefir ferments much more quickly, it’s easier to make smaller batches. Healthy organisms - Water kefir contains more than 400 types of bacteria and yeast that promote gut health and immunity. Milder flavor - Water kefir is much milder than Kombucha. It actually has a bland, plain soda flavor that is easily jazzed up with flavorings. For those that don’t enjoy the tart and tangy flavor of Kombucha but still want a natural, healthy probiotic beverage, water kefir works great. Safe for the family - Water kefir is good for the whole family with no caffeine or dairy. Kombucha Kamp’s water kefir grains make about 1 quart of water kefir to start. Put the ¼ cup sugar into the jar. Add the water to the jar, and stir to ensure it is dissolved. Cover with a cap or cloth. Let sit out of direct light for 1-2 days. Don’t wait more than 72 hours, because the kefir grains will simply starve and disintegrate. When pleasantly fizzy, lightly sweet, and just how you like it, strain the water kefir to recapture the grains, which can be used again. Keep these helpful tips in mind so that you can continue making delicious fizzy water kefir “soda” for yourself or the whole family. No need to rinse the recaptured grains - they’re ready to go again just as they are. Kefir water grains reproduce, but won’t always reproduce more grains in every batch. That’s okay though, because the grains are able to be reused again and again. Water kefir grains will ferment the sugar water mixture best anywhere between 68-78°F (20-26°C). Cooler temperatures will result in a slower fermentation time, and warmer temperatures speed the process up. Just keep an eye out. What Are the Benefits of Water Kefir? Water kefir, like all fermented drinks and food items, has plenty of health benefits. It is a probiotic drink filled with healthy bacteria, yeasts, enzymes, acids, vitamins, and minerals. These gut-health-promoting elements improve immunity and overall wellness. Water kefir does contain sugar, but it is easily digested sugar that doesnot interact with the body like regular table sugar. This is because the water kefir grains have broken down the sucrose into fructose and glucose, making it easier for your body to digest. The light sweetness of water kefir makes it the perfect alternative to high sugar sodas. 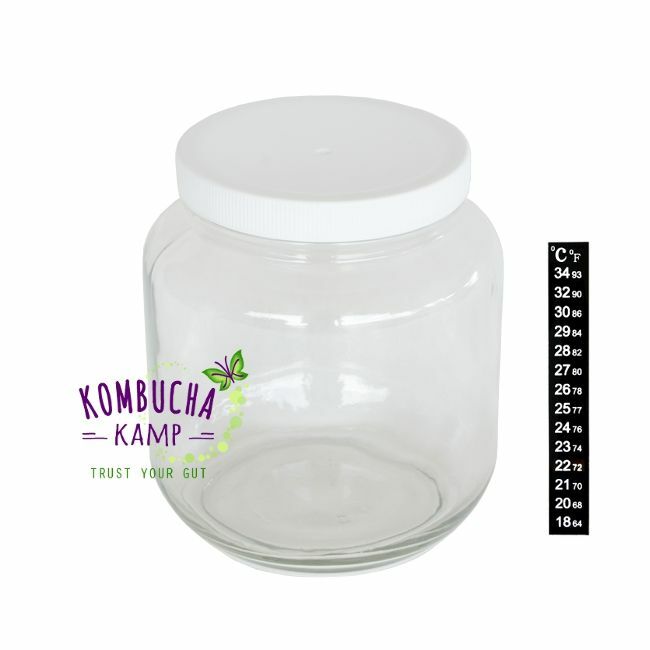 Kombucha Kamp is your go-to supplier online for helpful information and supplies for making your own fizzy probiotic beverages. Whether you want to make Kombucha, JUN, water kefir, or milk kefir, Kombucha Kamp can help. Trust our years of experience and expertise, thousands of positive customer reviews, and of course, your own gut! Reach out to us by IM, email, or telephone if you have any questions about using our water kefir grains. 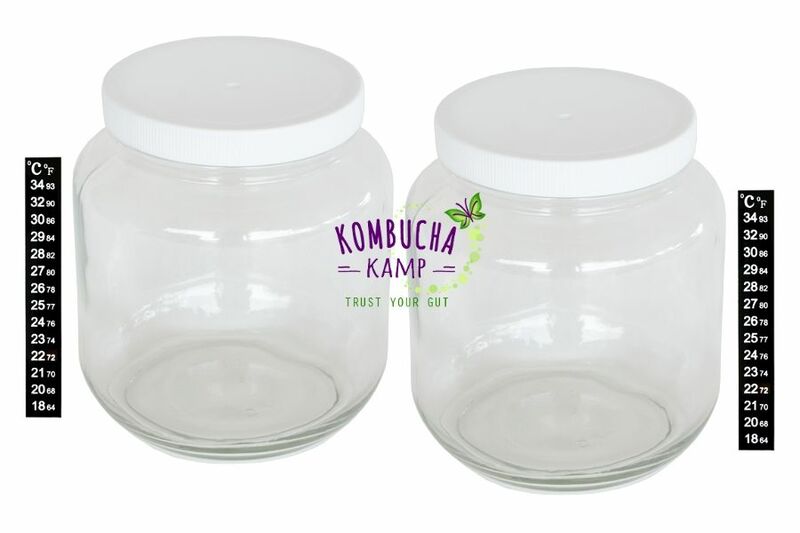 I thought the double packaging for the water kefir grains and kombucha scoby indicated a well-thought out marketing plan, showing a desire by KK to ensure the product arrives complete and in safety. I was grateful to try the tea blend, as well. It didn't take long to get, either. Five stars! I love the water kefir.grains, they came quickly and they were very healthy. Fast shipping and healthy grains. These guys are the best at what they do. Purchased the water kefir grains to make for the first time and I must admit that it is working wonders. It's been a month and the grains are so healthy that they have duplicated. I'm so grateful that they are working for me, and I already started to feel great changes, finding balance and that they have become part of my lifestyle. I would definitely recommend these little guys to anyone! 💕 Great service and it was worth the wait! This is the first time I have ordered form the company, and I am very impressed!! My mother and I both ordered the water kefir grains and are very pleased with them! They are doing wonderful! It is great to have a live person to speak with when I have a question. Love the product, love the service!!!!! I have previously brewed Kombucha for several years and Milk Kefir. This is my first attempt at Water Kefir. The grains are fresh, healthy, and multiplying like mad! I've tried several different flavors and still have a lot to learn. Looking forward to a long, healthy life with the WK grains and will definitely recommend you to others. I've been making water kefir with my live grains for about a month with no problems. The jar and grains arrived in good shape. I'm actually having fun using these little guys and they have multiplied enough that I have give several quarter cups away. The water kefir grains are top quality. Even though they were in transit for 15 days, they brewed a perfect first batch. They took longer to reach completion but the instructions were so detailed & complete that I felt very confident @ every step of the way. If I was a USA resident I would buy ALL my products from you, but the exchange rate & long shipping preclude that option. However, I was very impressed by how fast my order was put in the mail & how well packaged it was. I am going to take very good care of those grains in order to multiply them for lots of future brewing. Thank you for fantastic instructions covering every possible scenario in brewing adventures. Customer service is excellent & the product is the best. I purchased my water kefir here about a month ago, along with a jar. Everything arrived quickly, and ready to go, with instructions. Getting started was a breeze and we have made water kefir daily. The grains were alive and ready to do their work. I recommend this to everyone. Excellent customer service as well if you have questions! Excellent water kefir grains quality. They were shipped in very good conditions. We are very happy with the product and enjoying very much the drink. I have been very pleased with these grains. I've been using them for weeks, and have had no problems! Purchased my water kefir grains about a year ago because I wanted something possibly a little lighter & summery. Love me WK now. I've never had a bad purchase experience with KKamp. As a kombucha home brewer for the past 3 years, I was interested in the coconut water kefir recipe. Glad I tried it! It inspired me to actually buy a bottle of milk kefir to try which I loved. The water kefir grains aren’t for me, but they came in great condition and packaging. Can’t complain! amazing! i think i'm going to switch to WK instead of kombucha b/c it's so much easier. the grains work great, the shipping was fast, very happy! So Happy with my Kefir grains! They arrived quickly and in great shape. They have quickly reproduced and I was able to share some grains with my family. Thank you!! My grains arrived healthy and ready to brew. They took two batches to get up to speed and now I have a new quart of water kefir every two days. I secondary brew until the top pops when i open it, then into the refrigerator it goes. My husband has stopped drinking soda because he loves the grape kefir I make for him. 5 out of 5 starts! They arrived quickly, looked beautiful and healthy. They are multiplying more quickly than I can keep up with! I have 6 bottles of fresh kefir currently, more brewing on the counter & 2 jars of extra grains sitting in my fridge to share with friends. Experimenting with flavors has been fun and my kids love it. I have 2 children with dairy allergies, so I stopped making milk kefir, and buying water kefir each week was a huge expense! Thanks for this great product. I will definitely recommend you to friends. Very pleased. This is our first foray into making fermented drinks and we are thoroughly enjoying it. My kids love the taste and we are having fun playing with flavors and recipes. We have only been at it a couple weeks and our grains have more than doubled. Thanks! I looked at water kefir grains on other sites before finding Kombucha Kamp, and I'm so glad I found this site! Not only is the product great, but the information they provide makes it easy to catch on to brewing kefir. I'm having great results with super tasty kefir pop! (Seattle WA) I was so happy with my milk kefir grains I decided to add the water kefir grains for a little variety and I was not disappointed. Compared to the extended time it takes to make kombucha, the water & milk kefirs are ready in 1-2 days and loaded with their own benefits. Tastes great, my daughter loves the different flavors I make, thanks for the fast delivery and great products!! (Worcester, MA) Thank you! thank you! thank you! Hannah for personally calling me back and going over all my questions with milk kefir and kombucha. From that I ordered water kefir and absolutely LOVE them! Tasty, lightly sweet, naturally occurring 'soda' that makes your belly feel great! The water kefir grains came packaged very carefully and worked right away! I have not stopped brewing since mid February. Since water kefir has no caffeine it is my evening go-to drink. If you're thinking about trying it, I can tell you it is NOT complicated at all and the benefits to your gut are beyond measure. (Allen, TX) I ordered the Kefir grain in Aug 2017, so far I have made 67 batch of kefir water with it, my kids and I really like it. My younger one has eczema and the water kefir seems to help with that. The grains are really easy to use and I'm so glad I started on water kefir. I just wanted to say thank you for my beautiful water kefir grains. I couldn't have gotten them at a better time. I was originally drinking Kevita water kefir and they changed the ingredients so I could no longer drink there product. God bless you and your company. I hope you thrive like my water kefir grains are! God bless! Thank you for my wonderful kerfir grains. My other ones from you died when I was gone with cancer surgery. We love our water kerfir! My 2 tbs is now making a gallon of kerfir. I just want to thank you for the high quality of your product. My daughter ordered her kefir from you and wow was I impressed. High quality all the way!! We stopped drinking kefir last fall and both my husband and I have not felt the same and tried to figure our why and then he mentioned the Kefir. I have now placed an order and can't wait to get it. Thanks again for you wonderful product!! God bless you! I am very happy with my water kefir grain purchase. I started with one quart jar & have expanded to two. It is so fizzy & delicious! The grains arrived in great condition & have flourished! I will enjoy brewing water kefir & kombucha. A few weeks ago I made a first-time purchase of water kefir grains. I ordered only one package, which is two tablespoons. I haven't stopped using the grains since I purchased them; I just keep starting another batch of kefir water, one quart after another. The grains are very strong, and in three days they make a nice, bubbly drink. Also, in such a short time, the grains have multiplied to greater than two tablespoons. I think I have three tablespoons now, and in a day I will measure them again and use that extra tablespoon in a pint jar. I am very happy with my purchase, and my friend just ordered some grains from Kombucha Kamp last week, so the word is getting around. Thank you! I cant believe how easy these grains are to use, they are thriving and in only 3 weeks I've made a dozen batches! Love these grains. I've purchased from other businesses and these are the best. They are growing and now I need to figure out what to do with the excess. I also purchased a batch from a different company at the same time so I was able to compare them. My daughter loves water kefir, and she loves the ones we purchased from Kombucha Kamp. The grains fermented in 48 hours the first time we fed them, and we were thrilled! Subsequent batches are still coming out great. I'm a big fan. This was my best purchase from Kamp Kombucha! This product alone is healing my gut. I can drink it up to bedtime and in the middle of the night as well. I only purchased a single batch and regretted it. The grains must love my space as it doubled in a month! Thanks, Kombucha Momma! I am 1 week into doing the water kefir.... LOVE them!! The grains showed up healthy and ready for brewing. I followed the directions provided, and posted on this site. The water kefir grains have already multiplied to 3-4x as much! I am having so much fun making stuff with my kefir. So excited about the health benefits for all of us!! THANK YOU!! I love the water Kefir. The taste is like the best champagne with no alcohol or almost no alcohol. The grains arrived in winter and still worked very well. I have made pumpkin ginger, cherry, raspberry, rhubarb, orange, grapefruit, lemon ginger water kefir. MMMMM it has all tasted wonderful. I give the water kefir grains five stars. I purchase the water kefir grains. I received them fast and was able to start making water kefir that night. The instructions were quick and easy to understand. They arrived a little weary from the road (it's a long way to Florida). With a little pampering they are now doing really well. I'll certainly buy these again, as needed, and I'll use an expedited shipping option for their sake. Making the water kefir is so easy and delicious. I make a batch every two to three days to keep a constant supply and a happy household. My order came nicely wrapped with perfect instructions. I will definitely be ordering more from you. Thank you! Just letting you know that I've really been enjoying the kefir grains and making fruit-infused kefir water. And it's definitely had a really positive effect on my belly! Much less bloating and discomfort at the end of the day now. Thank you so much! I ordered two packages, but they did not propagate. Supplier thankfully replaced at their cost. The replacement order took approximately 10 weeks to grow to full strength after frequent management and a lot of TLC. It’s now producing well, and the flavour is the best yet. Thank you. Service was great! The water kefir granules arrived in just a few days, much quicker than I anticipated! Absolutely no problems! Thanks again, I am recommending you to everyone as the go-to place for kefir or kombucha starting! 5 stars out of 5!! I purchased the water Kiefer grains and they have not reproduced very fast but they have produced wonderful water Kefir that I love and my grandson and everyone else that I offer some love also. I have talked to customer service about the fact that they're not reproducing and you have been very supportive and I'm playing around with different situations trying to get them to reproduce more quickly. Your comments have been extremely helpful and I'm quite sure that the grains were healthy but I'm learning and your being patient with me in that matter. Thank you for your assistance. Awesome product with quick, no hassle delivery. My water kefir grains were alive and well when they arrived. I definitely recommend purchasing here. Highly recommended company and grains. My first cultures arrived and I could not revive them. The KK company sends me another one without cost. the second culture was perfect ferment well with large bubbles, I thought to put and mix the first culture that had it in the refrigerator, to revive it with the good one(I do not recommend doing that) all died! :( I'm going to try again later and of course I'll keep buying here!!! Excellent water and milk grains! Got these water kefir grains a few months ago to use for my grandkids. They came, as usual, well packed and with great instruction. The grandkids and their parents love the kefir. Thanks! We love the water kefir grains! They arrived as described in a timely manner. My children love coming up with new flavors and ways to use our water kefir. I keep half of it unflavored and use it in my morning green smoothie! These water kefir grains are incredible! I am totally new to making my own fermented drinks- these grains are pretty much fool proof! They came in a vacuum sealed bag with directions. I was able to brew delicious water kefir right away! It's been over a month, and the grains are thriving. I highly recommend these water kefir grains! I bought freeze dried ones at the store...these ones are incredibly better! I've tried other, dehydrated kefir grains and didn't have much luck with them. These went to work right away and have been just wonderful! Grains came nicely packaged and ready to go. I need to figure out how to get more carbonation. However, it's tastes great. I switch off between kefir water and kombucha. Hoping my gut appreciates it. Thank you! Grains arrived in perfect condition. After about the 3rd brew I started getting amazing flavors and bubbles from my brews. Hands down, the easiest ferment to make, and so tasty! I've had my grains for at least 2 years now, and they have become a staple in our home. We brew a gallon every two days, and pour into a large glass dispenser with a spout that we keep in the fridge for the second ferment. The kids can pour some water kefir as they like, and I bottle it up for my husband to take to work. In the winter, we usually do second ferments with organic juice (cranberry, grape, cherry etc.) Comes out bubbly and refreshing every time. In berry season, when organic fruits and berries can be had in plenty at farmer's markets, we load up fruit into a diffuser ball and let that sit in the water kefir for a few weeks. Super yummy! I've given many batches of grains away to friends, introducing them to the wonders of this product. When our second child was born, at about 7 months, we started giving him some, and other than breastmilk and water, that's all he ever drank. Needless to say, our kids love it! Thank you for sharing the love, KKamp! I give my recent order from Kombucha Kamp 5 stars. It arrived quickly, was exactly what I'd ordered, and I found the instruction page that came with my kefir grains very helpful. Kombucha Kamp was recommended to me by my cousin and I have since referred some co-workers to their website. Great service and products. Love my water kefir grains! It took about 2 batches before they really started fermenting. I assume it was to adjust to the type of sugar I was using (sucanat). My kids, husband and I go through the kefir water too quickly that I need to order more grains to stay on top of our habit. 😉 Shipping was fast and the item was received alive and well. I will be ordering all my grains and supplies from this company. I highly recommend. I am very pleased with my purchase of Kifer grains. I followed the directions and wala I now have water kifer that I add organic wolfberries to and give you all 5 stars. I have used these grains for a few months now and every two days I have delicious fermented juice! I feed my baby the fruit and the juice and she loves it. Thank you Kombucha Kamp! The instructions were easy and straight forward. My grains arrived within a few days of ordering and I was able to start brewing right away. Absolutely love it! Very happy with the grains and the guide that came with it! The water kefir grains came within a few days and were fresh, healthy, and ready to work. At first, I wasn't sure if I was doing it right, but Kombucha Kamp was very responsive and helpful, and by now I have made several batches with confidence. My family loves the different flavors we have tried. Excellent, friendly and helpful customer service AFTER the purchase! Why do I say this? 1) Quick response to an email helping me create a recipe to mimic a favorite store-bought flavor. 2) Additional details provided to me based on my off-hand comment that I needed to store the grains for a brief vacation. High-quality product with all the support needed to get you started. Why do I think this? 1) Super easy to follow instructions delivered right with your order. 2) Apparently I am not the best water kefir grain mama and I brew a little on the long side (twice now), which can negatively affect the grains. I've also stored and revived once. Yet, my grains are still going strong producing great kefir and not diminishing in number at all! This was my second time receiving grains from KK. The only reason I had to come back was due to a mistake I made with the first ones. Both times the grains have arrived super fast and in great shape. They grow very well and I have noticed a huge improvement in the way I feel. My arthritis does not seem to act up as bad as before and my 'gut' is much happier, and my old age acne has disappeared. Thank You!!! After watching a lot of Hannah's interesting kombucha videos I was very happy to support her by purchasing water kefir grains recently. They came in a timely fashion and have multiplied ever since! Very happy with the product and service and would order from again! I am very happy with the water kefir grains. They were easily tracked as I waited patiently for the mail to deliver. Grains were nice and healthy and were a nice chunky manageable size. Took several batches as expected to balance and are now happily bubbling away. I notice lots of floaters now, so they are now reproducing. I also was glad I could order over the phone. Overall, I give you full stars, you have a great product with great service. This was the first time I've tried kefir grains. I was very happy with the results and will continue to use them. I rate you 5 stars. I purchased the Water Kefir Grains and they worked great the first time! After 3 weeks I had enough extra to give away. The instructions were easy to follow and had great ideas for flavorings. Very impressed! Best grains I've ever bought, they have grown and I have been able to share! Water kefir grains arrived quickly and in perfect condition in spite of the cold temps here. The directions are excellent and the recipes tasty. Took about a week to get the fermentation going well, due to my room temperature of 62 degrees. Solution was to put the glass quart jar in a small crock with a heating pad wrapped around the crock. Perfect for 2 day fermentation and then a 2 day second fermentation with flavoring. I pack the 2nd round in single serving, glass beverage bottles with tight caps for convenience. Raspberries are a lovely addition for color and taste. Through the extensive family gatherings this holiday, I am the only one that did not get sick! We love our water kerfir grains from you! It has already double so I'm making two quarts. We have tried different flavors and enjoy them all!! Thank you so much! I had ordered water kefir grains from another supplier and the grains where small and did not reproduce so I threw them out and ordered these water kefir grains from Hannah. I'm wish I had ordered my kefir grains from Hannah first because they are HUGE and they make delicious water kefir and they have already reproduced! Highly recommend!! An emphatic 5 stars! I've purchased water kefir grains before and they always come dehydrated. It always take a few sugar water bathes to get them going. These little suckers were packed in their own sugar solution and were ready to start producing IMMEDIATELY! We were enjoying fresh kefir in days. I bought 4 packages--two for my mum and two for myself. I use my two to make a 1/2 gallon at a time. I ferment for 3 days, add juice and ferment a second time for 3 more days. Supper bubbly, super delicious, and always a huge hit. I use turbinado sugar and after only a month my grains are ready to divide. I highly recommend this company for their amazing grains. Happy brewing! I have many a field day making, flavoring, and drinking water kefir. The health benefits include added probiotics to my gut. "Trust Your Gut!" I'm satisfied using cane sugar juice as I like the bit of sweetness settling in my finished beverage. 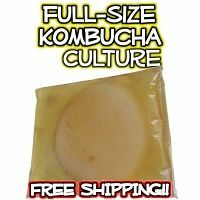 The SCOBY matrix came looking healthy and fresh soon after I ordered. It didn't take my dynamic grains long- only a couple of batches to produce more grains. I am contented with my very lively water kefir grains. The more the merrier to make more and share more. Luxiuriate in watching the multiplication process, listening to your ferments sizzle, concocting and sipping drinks, and reaping the benefits of exuberant health. Wow! These are the best kefir grains I've ever used. Fresh is definitely best! The flavor of my kefir was amazing in just a couple of days. Thanks for your great work! Love my water kefir grains! Even got my husband drinking this stuff! I LOVE LOVE LOVE the water kefir grains! The grains were ready to go, so I didn't have to wait weeks to try them. In San Diego, without temperature control, during "winter" and the grains fermented in 24 hours, then the second ferment over night! The ginger flavor from kombucha kamp is perfect! I enjoyed my first ginger kefir soda today, not too sweet and very bubbly. I have been enjoying the continuous brew for several months and was hesitant to add another ferment to my routine, I also make sauerkraut, SO HAPPY i did Water Kefir grains ROCK and are so delisious flavored!!!! Plus they ferment FAST! So you can enjoy them while waiting for your kombucha! Thank you, thank you, thank you!! Great products, wonderful service… my belly is happy again!! I have always wanted to try kefir. I was so pleased with the prompt shipping and excellent support!! Wow! You should be very proud! great product and good service! many thanks! I bought water kefir grains from Hanna and have blessed her daily! I had purchased some from another site and they just never did much. When Hanna's came they were Huge, healthy and thriving! I've used them for about a month now and they're ready to divide. Absolutely No trouble when you buy from Hanna!! I have, and will continue to, recommend these to everyone! They're simply the Best! Thank you Hanna! I can't say enough about the quality of these water kefir grains. I am totally impressed!!! Also customer service is outstanding. Will recommend to friends for sure!! OMGosh...I LOVE my water kefir grains! I had been making milk kefir, but my body is handling the water kefir so much better. It's so easy to do...just every 48 hrs. I have a cup everyday....sometimes more. And all my questions that I had about my grains were answered on website. I did call and talk with Hannah to make sure I did my grains properly and absolutely loved that I was talking with her. She was wonderful and so helpful. I do add the unsulfured molasses to my grains and its a wonderful flavor. I couldn't be happier and more satisfied with my water grains!! Very healthy grains that are easy to use. I'm on my 4th batch, this one made with muscavado sugar to boot and grow the grains. I've ordered dehydrated grains from other sites in the past and I was so disappointed in them. The grains that Hanna sent are amazing! They are HUGE. They ferment very quickly and they have been extremely hardy. Sometimes I travel with work on short notice and I don't have anyone to take care of my grains for a few days but I give them a little extra sugar and even after 4 day stretches they have been going strong. The dehydrated grains couldn't even recover from 2 days here and there. Holy cow!! I am beyond impressed with the quality of the water kefir grains. batch after batch of water kefir keeps getting better. The B E S T water kefir grains on the market bar none. (I know because I have bought others and they pale in comparison) Arrived promptly, healthy, thriving. I will buy again and recommend to friends! I had ordered these from another supplier but was disappointed with them. I have since ordered these from Hannah and couldn't be more pleased! I highly recommend Hannah and her products. I like the water kefir grains I ordered. They seem to be working well! the grains arrived quickly and in perfect condition. I followed the directions provided and have been making water kefir for a month and the grains are growing and multiplying nicely. I'm very pleased that I purchased from Kombucha Kamp! I took time off of fermenting because of life changes, and now I'm getting back into it. I remembered last time I ordered from different places, the kefir (milk & water) came dehydrated, or just wouldn't work because they dried out during shipping. With Kombucha Kamp, I've always been happy! This time is no exception. I ordered a packet of water kefir and in 2 days it was at my doorstep, in a puffed up pressure packed plastic wrap, with a second layer around it for protection. I was very surprised since the water kefir were in awesome shape when I pulled them out. I love Kombucha kamp. I started continuous brew Kombucha last December with Hannah's crock, cover, warmer and tea. So thrilled with with it, I added the water kefir grains a few weeks ago. I'm amazed at the wonderful taste and ease of use. Every KK product I have tried has been superb quality and I couldn't be happier! Now my grand kids get strawberry kefir water instead of soda! Makes delicious fizzy drinks! My kids love them! Awesome alternative to juice and soda. They arrived quickly and were quite healthy. I was experiencing water kefir within a few days! I can't say I'm one of those that enjoys it straight. This is my first experience with water kefir, and although the taste is mild I find the aftertaste a bit unusual (not yucky, just unusual). I now do a second ferment with half fruit juice, which is great (apple cider is my favorite, ginger juice is also great!) It's also perfect for chia pudding and smoothies, or thinning yogurt to kefir consistency (much healthier too). My microbiome is happy with me. I struggled a bit at first with getting my grains to ferment and my first two batches did not get fizzy on the second ferment. I contacted the seller and they quickly provided some suggestions that worked immediately! I am creating Kefir "soda" successfully now and am very appreciative of the excellent customer service! These were great. My first batch was good and by the third batch it was great. I ordered this to be shipped to India. The water kefir was stolen from my package. KK no questions asked resent my order and they made it no problem second time around. I love the taste and brewing has been super easy. Very happy with your customer service and with the water kefir! Thank you. When I purchased these I had never used water kefir before. I was skeptical not only that it would work but when my grains arrived, they looked so small that I thought there was no way this was going to go well. I followed the instructions to a "T" and I can honestly say that I was very pleasantly surprised. Product arrived quickly and extremely well packaged. I set up my grains according to included instructions and in a very short period of time, I have more grains than I know what to do with! :) These have grown exceptionally well and have increased almost 5 times from original shipped amount. Work like a charm and I am extremely happy! I had one question for the company when starting and I sent an email. I received a response in the same day and within a few hours. Fantastic! I've had my grains now only for a little over a month (not quite two) and I have milk grains as well. Both have grown so fast that I have literally a large pile of each! Great company, great product, you will not be disappointed! My water kefir grains worked from the start. I've had them about a month and already they doubled. I'm enjoying using ginger root (for a light ginger ale) and elderberry syrup (like a fruit flavored soda) to make drinks for the family. The grains are incredibly easy to use and ferment within 1-2 days. Highly recommend!! I purchased water kefir grains from Kombucha Kamp and LOVE them. My kids will actually drink this sweet, mild, probiotic drink! Mom Win! I'm so pleased with your product, and I'm happy to share a great review! I ordered milk and water Kefir grains several weeks ago. I am fairly new to the world of ferments but these 2 products sounded quite easy for a novice. My delivery came quickly and was packaged with a hand written thank you note on the invoice. Again, great reassurance for my inexperienced brewer-self! I recently purchased water kefir grains from KK. The instructions were very easy to follow and the grains are really growing! I've moved them to a half gallon jar for fermentation two days ago. I've also been adding ginger for a second fermantation that tastes like ginger ale! Paid for expedited shipping, because i was do excited to try kefir, and it wasn't that much more. Got here quickly. Loved how easy it was to get started and how easy it is to keep going. First time I've ever done kefir and I absolutely love it. Tried a papaya and lime ferment and it's awesome! Thank you Kombucha Kamp! I love this kefir! I ordered these with the intention of trying water kefir, and instead fell in love with it! Grains arrived very quickly, and the ebook that was included when I ordered was very helpful. I was new to the kefir process, but felt confident with the thorough instructions. And now I can't make enough! Thanks, KK! Love my water kefir grains! They arrived quickly in great, healthy condition! Thanks Hannah! Made several very fizzy batches of water kefir so far. Fizzy right from the first batch! Not reproducing so far, but not going anywhere either... Very tasty, and super easy! Grains arrived quickly, and they've doubled by the second batch. Love them! Purchased the kefir grains with not alot of expectations. The grains have grown so fast. The grains arrived quickly and the packaging was great! Thanks so much. I am a repeat customer and would not buy from anyplace else. These are fabulous grains! I've made several batches so far and they are doing well! I've had these grains for over a month now and they're still working and multiplying. Great product! Kombucha Kamp customer service is great! I purchased my water kefir grains which arrived the second day after ordering. They were packaged wonderfully to protect the product with great care and instructions. I immediately set into action in getting them welcomed into their new home. Unfortunately my kitchen stays around 68 degrees which is the low end of cultivation so I have been patient and not throwing in the towel. Hanna has been so encouraging and supportive giving me feedback. I am hoping I didn't do something disastrous to harm them but did follow the instructions shifting them from molasses to fig. Due to this being winter and much cooler is undoubtedly reason why I must continue to be patient. I am new to water kefir however culture milk kefir and kombucha so I am stumbling along learning about my new product. Thank you Hanna for your patience and guidance!! Great little Kefir grains, once they accepted the new home they just started going crazy. My purchase arrived very quickly, and was packaged with care. The instructions were very clear. I've been brewing water kefir for weeks and I love it! Thank you so much! The water kefir grains are growing super fast. I emailed with lots of questions and KK replied with lots of reassurance and guidance to get my wkg growing. Our family is reaping all of their health benefits. Thanks KK! Received my water kefir grains. They were vigourisly healthy. I have been enjoying my product daily and my only issue is that my grains are reproducing too quickly!!! Five out of five stars for water kefir grains. They arrived quickly and in great condition. Everyone in our house loves the water kefir and we've had lots of fun with the recipe suggestions on the website. I have just received my kefir grains over the post today and I am really looking forwards to my first ever kefir batch! woohoo! Thanks a lot, the service was great! I'll def be back on your website. Efficient, patient and friendly service. This has been a fun, educational and tasty home project. At first I couldnt tell if it was fermenting - the temp was low inside my home and I remedied that by putting them outside but not in direct sunlight. Super happy, the sodas I have been making are fantastic! Looking forward to many more exciting flavors. Thank you Kombucha Kamp!!! I purchased water kefir about a month ago and the grains are working great. After a rocky start of my own doing; I was able to email and get helpful support to let me know that my grains were working. Now my whole family is enjoying Kefir Soda every night! LOVE THEM! I am very happy with my purchase of water kefir grains from KKamp! Not only were my grains delivered very promptly but the support I received was excellent. I am now making water kefir on a regular basis. I have confidence in KKamp. Thank you. Wonderful experience. The water kefir grains are happy here in Brazil. See you next time. I purchased these Kombucha Kamp water kefir grains and they are fantastic! Fast delivery, quality packaging, amazing product. This was my first time making water kefir and it really is as easy as it sounds! My grains doubled in size within weeks and I've been able to share with family. Five stars; would definitely purchase again! Product was shipped and packaged well! I have been enjoying the homemade water kefir. This is a great product! Try it out, you will not be disappointed! When I received my water kefir grains they had sat in the mailbox all day I'm 90+ degree temps. Worried that they weren't doing well I quickly put them in the fridge. 3 days later I tried to brew first batch ... No luck. Thence second and third one failed as well until the fourth one, which I put in the garage to sit for 48 hrs. Now I can't stop the grains they are ready before 24 hrs! LOVE this product! I've made several batches so far. I do add a touch of molasses each time, which seems to keep it from being so sweet. It looks like the grains are growing a bit, and I'm looking forward to being able to make more than a quart at a time, because we'd sure drink more if we had it! I have been very happy with my water kefir grains. When I first got them, I had some questions and customer service at Kombucha Kamp was very quick to respond and helpful. Both my mother and my best friend have also ordered kefir grains from Kombucha Kamp! These Kefir Grains are high quality. The grains multiply quickly. Shipping was fast, so be sure you have everything you need to brew immediately upon receiving. The product is perfect, shipping very fast and accurate, packing excellent. I love my water kefir grains. Thank you Kkamp!!! The grains produced bubbles on the first batch! Pretty impressive! I give it a 5. Thank for the opportunity to score the service and product which I ordered. The service and water kefir were both excellent. I purchased Kefir grains and I’ve been using them. I follow the instructions with a little baking soda only when they looked a little weak. So far I’ve been enjoying kefir soda. They’re growing too! I feel that it’s helping me with my digestive problems. What’s great about it that it’s E-Z to maintain. I will have a bottle of Kefir Soda as an offering to my guest in my guesthouse. Thank you! I've had my Kombucha Kamp water kefir grains for one month now and I am very happy with my product! The shipping was fast (all the way to South Korea), the kefir was packaged nicely, the instructions was easy to follow and the follow-up service is great! The fact that these grains were hydrated made it really easy to get them going. The grains are producing great kefir for me and my husband to drink every morning. Water kefir is such a delicious and refreshing way to get all those probiotics. Thank you for a great product! I am so impressed by this product! First off they got to Norway in a week! The packaging was so well done and the grains were super healthy and survived the trip easily. It's been a month now and I am almost overflowing with water grains! Haha, these little guys proliferate so quickly. I make coconut water kefir with them and when I'm not using them for that I keep them in the fridge in a water and sugar mixture. This is probably the best internet purchase I've ever made! Thank you! I love the water kefir grains! 5 stars! They took a day or 2 longer to ship than I thought they would so they sat in my mailbox all day on a 80 degree day...but bounced back no problem. They made a wonderful brew on the first try! I love double fermenting with various juices and dried fruits and my 4 year old son can't get enough! I used to brew my own kombucha and found it too acidic and strong to drink. Water kefir is a great alternative. I really couldn't be happier with this product!! The kefir grains that I ordered from Kombucha Kamp arrived in a timely manner with all the instructions needed to help me get started. I have been enjoying the water kefir ever since. The two tablespoons of kefir grains have multiplied to 5 tblsp. I learned to make the lemon-ginger kefir, and I like it a lot. My picky-eater son has taken a liking to the grape kefir that I've been making using 100% grape juice. I also bought some Old Orchard Wild Cherry juice a day or two ago and used 1 part cherry juice to two parts kefir water, and it is delicious also! I purchased the water kefir grains a month ago. Never having had kefir water before I wasn't sure. I am so happy with them! True to the directions, (and very easy to follow!) they have doubled and we are enjoying them and seeing good results already! Thank you for an honest product! The product was absolutely perfect and far superior than what I expected. It multiplied very quickly so I was able to share with friends. I have ordered from other websites and was disappointed but this product was fantastic. Five stars!!! Love the Product!! I received the Kefir quickly and followed the instructions. My first batch came out great and now I'm on my 8th and my Kefir is healthy and growing like crazy. I had a couple questions and received a quick answer by an actual person. I love that this company embodies health and love. You can feel it in their product. Top quality product sent with love. excellent, these were shipped fast and packaged professionally. as soon as i got them, i placed them in a quart of room temp spring water, with a 1/4 cup of turbinado sugar.. i let them go for 24 hours, still a little too sugary, so i strained them and started a new batch. the new batch i let go for 48 hours and it was much better, it was really bubbling and the grains were floating up and down.. awesome. i did buy some from a local store that were kept refrigerated.. they did not come to life after several attempts. same water and sugar. i added just a bit of molasses to the third batch and they are really growing now. awesome. i highly recommend these guys! I love my kefir grains. I was advised in the instructions that I should give the kefir 3 brews and keep the air out. What a difference the 4th brew was. My kefir grains have tripled in a month. 5 out of 5 stars for the delivery and health of my water kefir grains! Thank you so much for your help through the process. I know that if I ever have questions, I can connect with the folks at Kombucha Kamp! My water kefir grains have more than doubled in the time I've had them! My husband loves water kefir with cherry juice or I've started making it with sweetened tea and lemon! With just the two of us, we have plenty of water kefir, and I really need another refrigerator for all my "science experiments" as my husband calls them! Your instruction sheets have been invaluable and I use them all the time to check measurements, etc. I ordered the water kefir grains and my whole family LOVES them! I make a new half gallon batch every day and there is never left over. We have added pomegranate juice and fresh pressed lemon to flavor our water kefir and it takes like pink lemonade!! WONDERFUL! Five Stars for Kombucha Kamp! 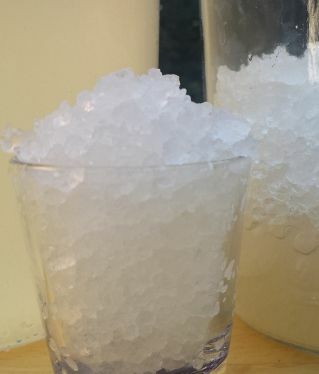 I ordered water kefir grains. As they were lost by the mail carrier, I emailed KK to ask for a replacement. They sent it out that very day and with excellent customer service. I got my grains a few days later and made my first ever batch of water kefir. That first batch was a bit slow and not much fermentation took place...the grains were clearly a bit fatigued from their journey. But I read KK's very clear instructions on how to remedy this situation, and within a few days, I had a perfectly fizzy, delicious batch of water kefir. In fact, my grains not only survived but thrived--within a couple of weeks, they had doubled in bulk, and I was able to start a whole new batch, doubling my output. I bought this so I could make water kefir for my boyfriend, who drinks way too much coffee and tea but no water. He simply doesn't like water without fizz, and constantly buying sparkling water or kombucha seemed out of the question...too many bottles in the landfill (and here's my plug for the environment: recycling bottles may be better than throwing them in the garbage, but drinking bottled water and other drinks still consumes TONS of our earth's precious resources in the manufacturing, shipping and even recycling stages...if you love our planet, don't buy bottled water!!) Neither my boyfriend nor I had ever had water kefir, and honestly, I didn't think I'd like it. Turns out we both love it, especially with the addition of a little cherry juice or a prune before a second fermentation...yum! Thank you Kombucha Kamp for a great product and great service. I was SO excited to make water kefir after a friend introduced me to it (kombucha kind of upsets my stomach a bit). I loved it, and was so excited to find you and your great, authentic and loving website and products! THANK YOU!! Your response was kind and SO helpful!! So far so good! They have perked up and even multiplied a tiny bit. I have been able to kefir it using Turbinado sugar, half a fig and 2 drops of concentrace minerals ( I have to use distilled water). I can hardly wait to make a half gallon at a time! Then I want to try your new Jun kombucha. SO HAPPY!!! I just purchased WK grains and it couldn't have gone better. First attempt was a yummy success. Thank you! I'd also like to pass along that I got your info from the Wellness Mama blog. I forgot to mention it when I purchased, but I wanted to make sure you knew. Here's to a good future brews and enjoying the 2F's I've got ready to drink now!!! After a bit of a rough start for this fermentation newbie, we love our water kefir. I emailed for some help and they returned my emails quickly and with great directions and encouragement. I have recommended your company numerous times already. Thanks for the help and great service! This was my first time making water kefir. The first batch of grains did not work; it stayed as sugar water. I contacted Kombucha Kamp and they were very helpful with sending tips and when those did not work, sending out a new batch of grains. The 2nd batch worked perfectly and we've been enjoying the water kefir immensely. Thanks so much for the grains and for the GREAT customer service. The water kefir grains arrived quickly and I have been using them for close to a month now. They have worked wonderfully and after the 1st full week started to grow so that I am now able to make 3 quarts at a time!! Thanks for a great product!!!! I ordered kefir grains from this site a few months ago and have been enjoying kefir soda daily. My kefir grains keep growing and producing wonderful results. I plan on trying the milk kefir grains next. I purchased the water kefir about a month ago and they have been doing well! The taste is amazing. Hannah has been so helpful in helping a newbie like me with answering many questions I had with my water grains. Thank you so much for the wonderful customer service. I really appreciate it. I would rate them 5stars.........and I never give perfect scores! The kefir that I've made is light tasting, but interesting; good by itself cold, but even better with a flavor, and I know that it is full of good things for my body. It doesn't taste a thing like milk kefir smells, which is a good thing! I'm not a yogurt person. The WKG arrived promptly and were very well packaged! I didn't have time to use them right away, because it was just before Christmas, so they sat in the refrigerator for several days. When I had time to make WK, I wasn't sure that I could see any grains in the pouch; they kind of blended in with the liquid, but I poured them into the sugar water anyway. I put it all into a French canning jar, locked down the lid, put them into my car and drove 5 1/2hrs. to family for Christmas! A couple of days later I smelled the liquid and it smelled different; it had that lacto fermented smell. I tried some; it was still too sweet. I waited another day or two, then poured the kefir thru a sieve. (So, my first batch took a couple of more days to mature than the subsequent batches have) I had more WKgrains than I had started out with! I probably had 1/3C of them. So I made more kefir. The grains kept growing and reproducing and getting fatter and fatter. I started looking for victims to give them to, when I hit the 2C mark at the end of about 1 1/2 weeks. Thanks for the great grains! I purchased both of these recently I am very happy with the results. My water kefir is very happy. These grains were just plain fantastic. I started them brewing right away and was pleasantly surprised at how fast they multiplied. I now have a surplus and have absolutely great tasting Kefir to chug. Thanks for the great start Hannah! This is my first time making water kefir and I'm very impressed with how easy it is. I'm sure that buying hydrated grains makes a big difference in the outcome. Very happy with the speed of delivery and quality of product and looking forward to trying kombucha soon. I purchased the water kefir grains and am so amazed how easy the process is! The simplicity doesn't compare with milk kefir. I'm anxious to try new flavors with it. I read about water kefir and decided I wanted to try it. So m husband bought the kefir grains from your company. They came in a timely manner and I followed the directions to make my first batch. They worked like a dream. I had water kefir in two days and immediately started more. It was so simple and quick. The directions were easy to follow. My kefir grains are multiplying like crazy. love that these come fresh and not dried, so I can make kefir right away! I purchased the water kefir grains and they are performing exactly like I would expect! Receiving them hydrated sure makes a difference and I have been enjoying a this wonderful kefir water everyday! I had such problems when I purchased dehydrated kefir grains. I have ordered the water kiefer grains They are very active and prolific! I have been able to give several people starts and still have all we need. They came in just a few days of ordering. I purchased the grains for my sister as a birthday gift. They are thriving and have already doubled in size. I had previously purchased dehydrated grains from another company & they never doubled. Will only buy from Kombucha Kamp from now on. Just wanted to say that I'm so happy with the results I'm getting from the Kiefer grains!! I purchased water kefir grains here a couple of months ago, and am delighted with my purchase. They arrived quickly and looked healthy. We were already brewing kombucha, and the water kefir is a delicious additional option, as it is very quick and easy to do, and very tasty, lighter and sweeter than kombucha, and we now drink both beverages every day. We've tried a number of flavors for our kefir, and our favorites so far are plain fresh organic ginger (tastes quite a bit like ginger ale) and plain fresh organic basil. My grains don't seem to have reproduced yet, but with the grains purchased we are able to produce a quart of kefir every two or three days. Very pleased with my purchase. I am very satisfied with the water kefir grains I purchased. I am new to the process and found them easy to work with. Once you get a system down, it only takes a few minutes to do. I already have enough to experiment with other bases like my well water or juice and it has been less than a month. Great investment in my health. I have been totally satisfied w/ my Water Kefir grains purchase. They have multiplied enormously since 1st brew & I am now beginning to share the grains w/ friends. I am enjoying both the flavor & healthy benefits from the Water Kefir. It has become a discipline that is both easy & fun w/ trying new flavorings. a very smart purchase & a quality product. I can recommend Kombucha Kamp as an exemplary customer service orientated, quality conscience business that I wouldn't hesitate ordering from over & over again. I've had questions along the way & Hannah has always returned w/ the helpful answer. THANX Kombucha Kamp! I purchased some water kefir grains from KK about 3 weeks ago. The grains came "live and active" in an nicely packaged envelope. I couldn't be more pleased with the results of making the kefir! The grains are happy and multiplying! The end product was fizzy and yummy within a weeks time! I would most definitely recommend this product to others!" my cultures were healthy even after a week in the mail. The water kefir tripled and was fizzy. The Jun produced a baby scobie. Thank you for making these healthy cultures available to the public. My water kefir grains arrived quickly. They are reproducing well. I cannot drink the kefir. It is causing me digestive problems. I will try a very little at a time. I will be taking these to Uganda with me to share this great health secret with them. I purchased mikl and water gratin and I was out of town so they actually sat for a about a week longer than they should have, but I tried them both and the they worked. I had to do a few rounds and they got better and better. I asked for help and they reply was quick and useful. A great company to deal with and I love the product!!! Thank you so much, I would recommend to anyone. I always wanted to try water Kiefer especially for my family since a few of them are not a fan of kombucha even though they still drink it. When I realized I could order them here from a source I trusted and they were live and not freeze dried I jumped on the opportunity. They came and were beautiful. I love flavoring it most with lemon flavors mostly like lemon-ginger, lemon-honey, lemon-honey-elderflower and just lemon are my favs. The picky family members enjoy this much more then the kombucha very sweet; however I still favor kombucha over the water Kiefer but both are fun and enjoyable to make and drink! Bottoms up! Thanks you for the fast shipment of my order. I already have my first batch of water kefir going and look forward to using your teas for my next batch of kombucha. Happy healthy cultures! Thank you Kombucha Kamp! My water kefir is flourishing! Ordered the water keifer, came quickly and and in good shape. Thanks. I am writing to thank you for providing me with the wonderful knowledge to grow Kombucha and Water Kefir. A "bacteria powered" colon is critical for optimal health in the marketplace today. Your online website is easy to understand and provided all the necessary tools to generate a bacteria powered body. I was skeptical at first about the time required to grow my own Kombucha and Water Kefir, but after about a couple of months, I saved time and money compared to purchasing other drinks at the store. In addition, the fermented drinks, which historically have been known to settle or clean the stomach and small intestines, were "raw" or fresh rather than dried. Things were going so well, I actually had more Kombucha and Water Kefir than I needed! If a customer needs to improve health, then ordering from Kombucha Kamp is an experience worth its weight in gold. Thank You, You're the best!! The grains arrived with the other products I ordered. They were healthy looking and well packaged. I am still using them and have used them many times they multiplied and now I can make as much water kefer as I need! I've been making water kefir from these grains for about 2 months now. The grains have grown to the point that I can make 1/2 a gallon in 24 hours and have been able to give away some grains. I like to do a 2nd ferment with cranberry juice - it has been a great replacement for soda and other commercial drinks. Really Happy with the water grains. Working and water kefir taste so good and refreshing. I purchased water kefir from this site about a month ago. Im impressed with how fast Hanna send me my grains! Very happy with my product! I enjoy my water every day and they are reproducing fast too!